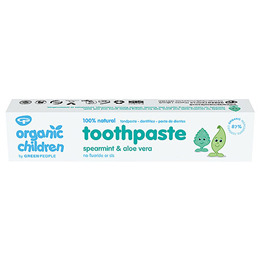 Green People Children Spearmint & Aloe Vera Toothpaste is a natural toothpaste designed for delicate teeth and gums. Flavoured with spearmint, peppermint and aloe vera. This natural toothpaste is made without Fluoride, SLS, Triclosan, Sorbitol, Parabens, phthalates, artificial sweeteners, petrochemicals and colourants to bring you the purest children`s toothpaste that nature can offer. Calcium Carbonate (Chalk), Glycerin* (Plant Derived), Aqua, Betaine, Glyceryl undecylenate, Xanthan Gum(corn starch gum), Aloe Barbadensis (Aloe Vera) Leaf Juice Powder*, Aroma [Mentha Piperita (Peppermint) Oil*^, Mentha spicata (spearmint) oil*^, Commiphora Myrrha (Myrrh) Oil^], Olea Europaea (Olive) Leaf Extract, Limonene*(from essential oils). Using a small amount of toothpaste, gently brush teeth and gums morning and evening,and preferably after each meal. There is no need to rinse remaining toothpaste away – left in the mouth it will continue to have a protective action against bacterial growth. 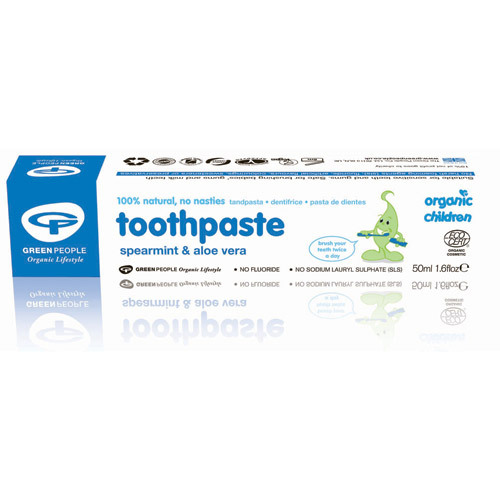 Below are reviews of Green People Children Spearmint Toothpaste - 50ml by bodykind customers. If you have tried this product we'd love to hear what you think so please leave a review.